The species is widely distributed in southern England except in the southwest. It is widespread in western and central Europe. X. nemoralis occurs in dry litter and bark in coppiced areas or clearings in woods, on short stony chalk grassland, on recently burnt heathland (up to about 4 years after fire) or bare patches on older heathland. It has occurred in large numbers, almost to the exclusion of other lycosids, on sparsely vegetated rail ballast in a disused railway marshalling yard and on sparsely vegetated ground at post-industrial sites. 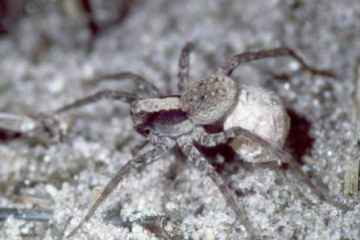 The spider is extremely well camouflaged against its background, populations having a more greyish or pinkish tinge according to the surrounding substrate. Adults of both sexes are found in summer. The spider is abundant at some sites in the south-east of England (mainly in Kent, Surrey, Sussex and southern Hampshire), but is very local and has shown some decline in the past 30 years. On heathland it seems to get scarcer in the west of its range. The loss of semi-natural woodland to intensive forestry, the loss of chalk grassland to agriculture, the loss of heathland to agriculture, forestry and development and the loss of post-industrial sites to development. Maintain open clearings and rides with dry leaf and bark litter and reintroduce or maintain coppice cycles in woods, maintain short chalk grassland by grazing, and maintain all seral stages of heather by rotational management.